A SAMPLE of premium grassfed beef from Wingham Beef Exports’ Manning Valley Naturally brand program in central NSW has topped entries in this year’s Sydney Royal Show Spring Fine Food branded beef competition. During Friday night’s awards presentation, 28 gold, silver and bronze medals were evenly shared among entries from brand programs across NSW, Victoria, Queensland and South Australia. 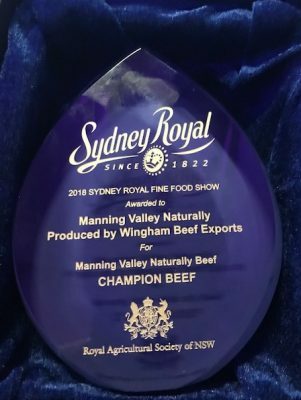 Overall champion beef entry, defeating grainfed and open (mostly Wagyu) class entrants, was NH Foods’ Manning Valley Naturally brand, processed out of the company’s Wingham Beef Exports plant north of Sydney. Wingham Beef Exports created its MSA-backed Manning Valley Naturally program in 2011, with a brand identity built around locally-sourced, HGP-free, grassfed, largely British-based yearling cattle for a heavy-domestic program. Carcase weights range from about 260kg to 330kg. The brand has enjoyed wide success in branded beef competitions across eastern Australia over the past four years, with gold medals achieved at Melbourne, Sydney and Brisbane shows. The sequence of results ranks it among the most awarded grassfed natural brands in Australia. While Manning Valley Naturally is finding its way increasingly into export orders as well, at the domestic level the brand is wholesaled through Nippon’s Beef Producers Australia division, for use in better-end food service restaurants, hotels and club style venues, as well as some selected quality retail sites. Some of the product also finds its way into Woolworths and Coles outside-purchase programs for specific cuts. 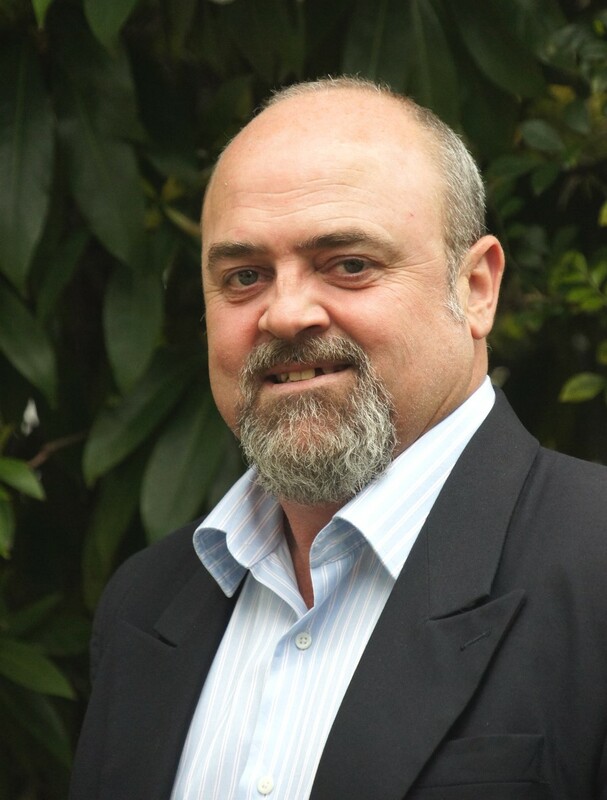 Click here to view an earlier article discussing the Manning Valley Naturally program’s origins, specifications and target markets. Wingham Beef Exports livestock manager Stephen Moy said the result was a testament to the dedication of the company’s selected group of high quality beef producers. “All our yearling cattle are purchased direct from these local suppliers, who this year we know are experiencing some of the toughest and most trying conditions they have ever encountered. But through their on-going support, we have been able to continue to deliver to our domestic and global beef customers a truly premium quality product,” he said. Chair of the Sydney Royal Spring Fine Food Committee and RAS councillor Lachlan Bowtell said this year’s competition was a testament to the resilience of exhibitors. “Even through the ravages of drought, beef producers have delivered yet again,” Mr Bowtell said. “The high quality and flavours of the beef and lamb entries presented to the judges this year made their role even more difficult. The awards aim to reward excellence, and this year was a true testament to the commitment and passion of beef and lamb producers, at times under dire circumstances,” he said. Chair of judges for the Branded Meat competition, George Ujvary said the overall quality of beef exhibits this year was high. “It was interesting to see the gap between the marbling evident in grassfed and grainfed beef exhibits closing yet again this year,” he said. The marbling of Wagyu exhibits was exceptional and flavour across all categories was very good, Mr Ujvary said. The judging panel for the Sydney Royal Fine Food Show includes food industry educators, product retailers, product users, chefs, manufacturers, technologists from industry, and other specialists and industry groups. In other divisions, topping Sydney’s grainfed beef class this year with a score of 92.67 points was a sample of Jack’s Creek F1 Wagyu, exhibited by the Warmoll family’s Jack’s Creek supply chain based near Tamworth NSW. The open class was won by Stockyard Kiwami, winner of the recent Melbourne Show branded beef competition, entered by Queensland’s Stockyard Pty Ltd, scoring 92 points from judges. This year’s medal results produced a combination of names already familiar in the brand beef market, but also some new names of recently-launched brands making their competition debut. Among these were the Ebony Black Angus and Carrara 640 Wagyu brands (silvers in the grainfed and open classes, respectively) launched recently by Kilcoy Global Foods (see earlier story); and Teys Australia’s new South Australian sourced HGP-free program 36 Degrees South, which earned a grainfed bronze. Bronze medals for entries awarded 74-81.9 points. Woodward Foods Our Finest Beef, Woodward Foods Australia Score: 76.17. Congratulations to all the recipients, in so few years branded beef has taken a quantum leap, I recall seeking registration of “Grasslands” in the USA for Cargill Inc and the USDA took us to court to stop its registration, after 18 months we won, the power of branding continues to generate value for the supply chain and the consumer.